Staging a wild setup at the Fisher Center for the Performing Arts, 2013. Verticales is a piece for Serge Modular Synthesizer and Symphonic Orchestra. In addition to the traditional instrumentation of a symphonic Orchestra, its unusual nomenclature includes 4 percussion sections, 6 gong players placed in 3 balconies around the audience, an electric guitar with alternate tuning, and a plastic bag for each player. 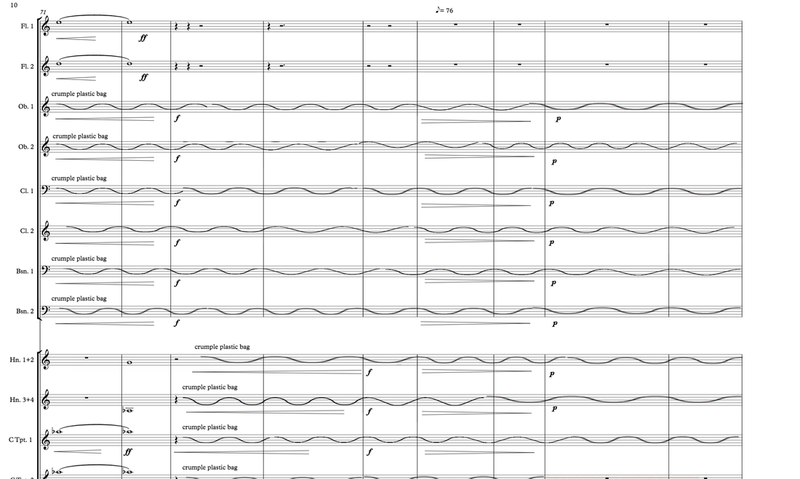 Performed by Daniel Fishkin on Synthesizer and the American Symphony Orchestra. Conducted by Leon Botstein. In Western tradition, music is often defined as a linear organization of tones or sounds used to create a melodic motif. Verticales challenges this preconceived notion of musicality by using texture and the spatialization of sound as its main structural elements. Ambient noise is in the foreground, and scales, arpeggios and cadences are left aside. Noise is devoid of any emotional signifiers and as listeners we are free to experience the piece as a reflection of our own thoughts, anchored only in ourselves.